What’s more, the average age of both undergrads and graduate students is rising, thanks in part to higher costs and increased student work hours. Nearly 40 percent of college undergraduates are over 25, and the older students are, the more likely they are to be holding full-time jobs. In short, there’s no longer a clear definition between “students” and “workforce.” They’re increasingly one and the same—and that’s why corporate tuition assistance programs are more important than ever. Here’s how employees, employers and the economy can benefit from tuition assistance. When companies support their team members’ education through tuition assistance, the clearest winner is the employee. With college costs skyrocketing and degrees becoming more vital, any savings on the cost of higher education are an incredibly welcome benefit. In addition to the obvious tuition savings, there are hidden employee benefits as well. By removing some of the burden of paying for school, employers who provide tuition assistance are also reducing student stress—leading to better performance in the classroom and on the job. Lowering tuition costs also frees up students’ funds for other necessities: child care, meals, transportation and rent. For those balancing work, school and home life, the financial freedom to pay for a car, commit to a daycare provider or move closer to campus can make a huge difference. Tuition assistance can make that happen. In its simplest form, tuition assistance is essentially treated as a benefit like health insurance or cell phone reimbursement: employees get a bill from their college, submit it to human resources with some paperwork and get all or part covered by their company. That model is a powerful recruiting tool and a great way to retain employees—but its one-size-fits-all approach may not be exactly right for your organization. To ensure your corporate tuition assistance benefit does the most good for your company and your employees, a more targeted approach may work better. Targeted tuition assistance programs provide funding for employees pursuing certain fields, majors or certifications. 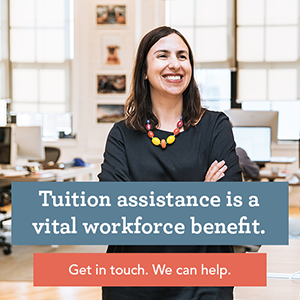 If one of the goals of your tuition assistance program is to develop skill sets within your own workforce, it makes sense to offer tuition assistance for coursework that’s relevant to your employees’ current or future positions. You may end up providing benefits to fewer team members, but you’ll be able to use the same budget to make a bigger impact for those who take advantage of the program. That’s not the only way to target a tuition assistance program, either. Interestingly, some of the largest and best-known corporate programs are actually designed to help employees move on from their hourly-wage employers to full-time careers. McDonald’s, for instance, offers the “Archways to Opportunity” program as part of its comprehensive effort to provide people with “their best first job.” The company recognizes that many of its brightest young employees will only be there for a short time; through generous tuition assistance, ESL programs and other benefits, the company boosts those students’ likelihood of graduating—and makes itself a more attractive place for college students looking for part-time work. Amazon’s “Career Choice” program is providing targeted tuition assistance in another unique way. The e-commerce giant is covering 95 percent of tuition, fees and textbooks (up to $12,000 over four years), for hourly employees pursuing certificates or associates’ degrees—as long as they’re in a field that’s considered “in high demand according to sources like the U.S. Bureau of Labor Statistics.” Covered fields include aircraft mechanics, computer-aided design, machine tool technologies, medical lab technologies and nursing; they may not directly benefit Amazon, but they do make it a desirable workplace for motivated students. Amazon’s corporate tuition assistance program has proven to be so popular that they’re adding onsite classrooms at several distribution centers around the country. Not all tuition assistance providers operate at that scale, of course, but partnering with higher-ed institutions and other expert organizations can enhance program delivery and reduce costs for both employees and providers. 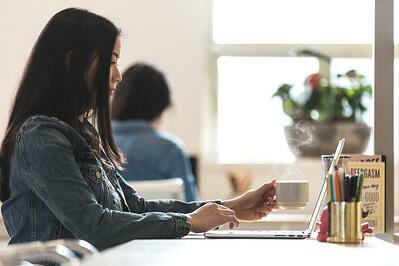 The most famous example is Starbucks’ ongoing partnership with Arizona State University. 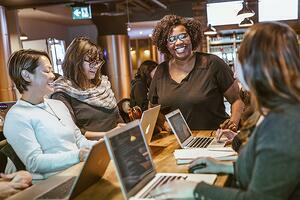 The Starbucks College Achievement Plan covers eligible team members’ full tuition at ASU Online, allowing them to choose from more than 80 majors. By partnering with an online program, Starbucks is ensuring that ancillary college costs like facility fees and transportation to campus don’t take a bite out of the budget; they’re also allowing employees to take full advantage of the flexibility of online learning. Starting or managing a corporate tuition assistance program can be daunting, especially for small HR teams. In that case, partnering with an organization like Scholarship America can help ensure you’re getting maximum impact out of your program—and managing it with maximum efficiency. To learn more about how Scholarship America designs and delivers custom tuition assistance programs, take a look at our free ebook! Supporting employee education truly is a win-win, and we’re here to make it the biggest win possible.